Galerie Mougin is located in the heart of the Carré Rive Gauche, between the Saint Germain des Prés district and Les Invalides. The artistic orientation is deliberately eclectic; the works are chosen essentially for their quality and originality and all contribute to the realization of timeless creations. the Farfelus Farfadets sometimes illuminate the gallery walls with their papier-mâché creations. For several years, the gallery has presented the creations in unique pieces or in small series by Tom Dixon, Christian Astuguevielle and Roland Meillan. Since the early 1990s, Laurence Montano and André Dubreuil have been laying their creations on the gallery’s iconic tiling. They both collaborate with prestigious institutions and several French, English and American museums have been tempted. A carpet was made at Les Gobelins based on a cardboard box by André Dubreuil. 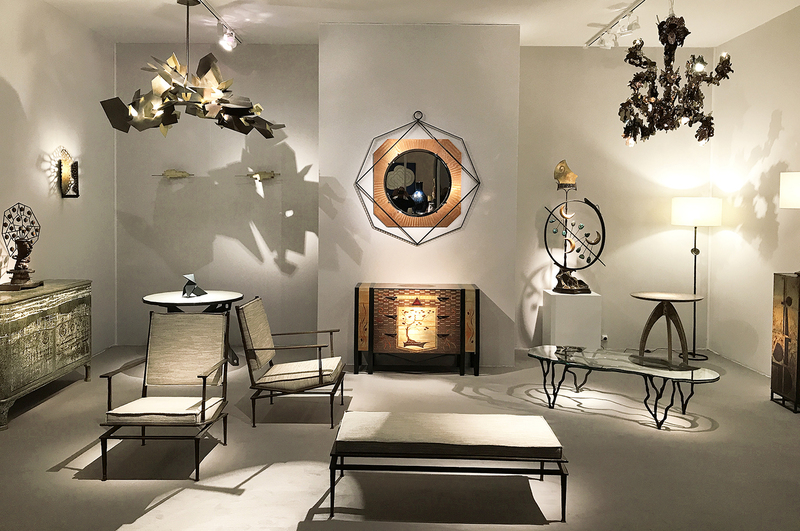 Several bronze pieces by Laurence Montano (pedestal tables, consoles, lamps) enrich the National Furniture collections. They have since been joined by Michael Pohu, Alasdair Cooke, Les Farfelus Farfadets and Thierry Leproust.